The Centre for Trade Policy and Development has urged the Zambian government to immediately renegotiate its debt owed to China. In a paper by Trevor Simumba titled “He Who Pays the Piper: Zambia’s Growing China Debt Crisis” CTPD said restructuring this debt is critical if Zambia is to avoid the debt distress that the IMF is warning against. CTPD Executive Director Isaac Mwaipopo said renegotiating the debt is a key priority for the Zambian government. Mr Mwaipopo said Zambia’s debt burden has risen dramatically in recent years, and Chinese loans form a major part of this debt. “Not only are debt levels rising, but the level of Chinese loans borrowed by the government for infrastructure and natural resource projects is significant,” Mr Mwaipopo said. He said these are clearly legitimate concerns that this public debt is no longer sustainable, meaning that the government might soon be unable to repay what it owes. Mr Mwaipopo observed that the scale of Zambia’s debt, and in particular debt from Chinese sources, is staggering. 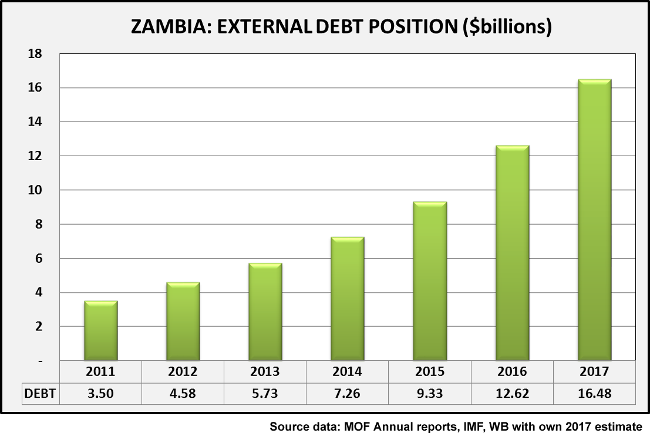 Zambia’s external debt increased from US$6.95 billion at end of the 2016 to US$8.74 billion by December 2017. Over the same period, domestic debt rose from US$3.47 billion to US$4.64 billion. all new loans contracted that year. Renegotiation of Chinese Debt: The Chinese ambassador has signalled that China would be open to considering a restructure of its debt to Zambia, and the government must seize this opportunity to try and gain better terms in order to lessen the chances of debt distress. Greater Transparency: Increasing transparency around the structure and scale of Chinese debt will help to both reduce market uncertainty and improve the value for money of Chinese projects. An independent audit of Zambia’s current debt position is a crucial first step. Strengthening of Debt Oversight Systems: The government must review and reform the current, ineffective debt management system. The system must be revitalised and it must be aligned to Zambia’s national planning needs to help ensure that Zambia’s debt is necessary and sustainable. Well said. The question is, DO THEY LISTEN? We all know where all this borrowed money has ended up. Why people still support Lungu is beyond logic. At least the international community has stopped lending this government money. The Chinese know what they are doing. They will own most of the national assets very soon. Meanwhile….Lungu is busy dancing, and travelling around like he is the new messiah. Chinese grabbed the biggest port, the International airport in Sri Lanka bcoz of their failure to repay debt. I’m certain that Chinese grabbing national assets like NRDC, Chichele Lodge, Chimbokaila, Kamwala prisons , Jacaranda school, Luburma Market etc. is linked to PF failure to service Chinese debt. KK International Airport will be given to Chinese, mark my words. By 2021, Vic Falls, Kuomboka, Nchwala ceremonies will be given to tu ma Cho-Cho-Lee. @ IndigoTyrol, It also beats me how some Zambians support Lungu & PF. Its called battered wife syndrome where an abused wife feels so attached to her abusive husband who batters her to death. Sadly, restructuring will lead to more borrowing. The more breathing space China gives to PF, the greater the propensity to borrow more until we reach Situation Catch 22 when we won’t be able to continue restructuring our borrowing! First we need to be informed as a nation the true level of our debt stock. We need a National Indaba to avert this looming! Solutions to serious National Problems should never be dealt with on partisan lines but should have a national character, taking all the 10 provinces and all stakeholders on board! The National Dialogue should be transformed into the national Indaba! The former is only addressing political party differences whereas the latter will help to address broader issues! Without memorizing Adam Smith and his “Wealth of Nations”, it is necessary to emphasize that capital (FDI) makes a difference in uplifting a country out of poverty. It is logical and consistent to borrow in order to build internal capital. The concern must necessarily focus on corruption and wasteful expenditure. For any renegotiation there will be a heavy price to pay.